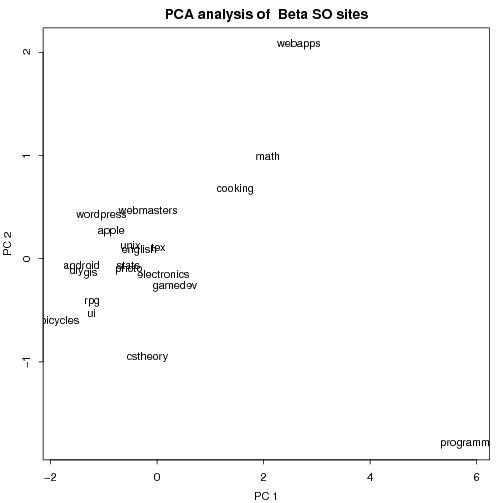 An analysis of the Stackoverflow Beta sites | Why? In the last six months or so, the behemoth of Q & A sites stackoverflow, decided to change tack and launch a number of other non-computing-language sites. To launch a site in the stackoverflow family, sites have to spend time gathering followers in Area51. Once a site has gained a critical mass, a new StackExchange (SE) site is born. At present there are around twenty-one SE beta sites. Being rather bored this weekend, I decided to see how these sites are similar/different. For a first pass, I did something rather basic, but useful none the less. Most sites are similar with the big except of programming and possibly webapps. Programming is different due to the large number of votes. They have twice as many votes as next highest site. webapps (and math) are different due to the large number of questions. Great post! I was wondering how to interface R with the Stack Overflow API. Thanks.